The Estates Theatre (Stavovské divadlo) in Prague opened in 1783. It is the oldest theatre in Prague, and the city's finest neo-classical building. Indeed, it is one of the most beautiful historical theatres in the whole of Europe. The unique charm of the Estates Theatre cannot be properly relayed by pictures or words. Once inside one almost feels the spiritual presence of the supremely talented musicians, directors, artists and playwrights who have passed through its doors. The Estates Theatre will be forever linked with Wolfgang Amadeus Mozart, the musical genius whose life and works had such an impact on the city of Prague. Mozart stayed and worked in Prague on a couple of occasions, crafting operas which would subsequently appear at the Estates Theatre. In 1786, although the world premiere of the Marriage of Figaro had been in Vienna, it was in Prague at the Estates Theatre that it triumphed. Indeed it was such a success with Bohemian audiences that Mozart was then commissioned to work on Don Giovanni in the city. In 1787, Mozart personally conducted the world premiere of Don Giovanni at the Estates Theatre. In the present day, there is often a run of Don Giovanni in the month of August in recognition of this special event. The main season at the Estates Theatre meanwhile runs from September to June, when various operas are staged, most of them by Mozart, but sometimes the works of other composers feature too. The Estates Theatre is located in between the Old Town Square and Wenceslas Square, a mere two minutes walk from either. 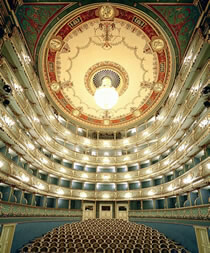 For listings and to book tickets for the Estates Theatre: Prague opera tickets.